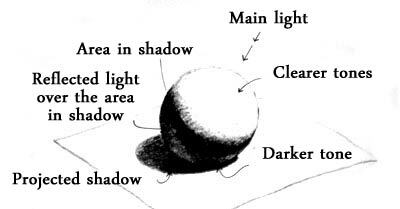 Painting shadows and lights is one of the most important exercises in painting. It is a tonal study that includes both the hue (color type: red, blue, green …) and the amount of light. Variations of lights, that is, the tone, form the complicated vision of our environment. We can see inside of these variations because the vision can´t work inside the maximum brightness or inside the maximum darkness. So, everything has a tone more or less close to light or dark, between the white or the black color. Gradation from white to black (gray has no hue). And tonal gradation with green hue. The value of the tones in the first image with grays corresponds to the value of green in the second image. Shadows are not all the same color but adapted to the color of the materials where they are. It sums the color of the light itself, and even, it sums other colors whose light are reflected. Moreover, the shape of the shadows is a logical and mathematical study. Depends on the object whose shadow is cast, and it depends on the surface where it is reflected too. Also, there may be other intermediate elements like atmosphere. If we have done an ilogical shadow or we have painted a distorted shadow, the human psychology is ready to detect the separation with reality. Of course, artists can decide if they want the shadow more or less realistic, to be more expressive for a specific reason. 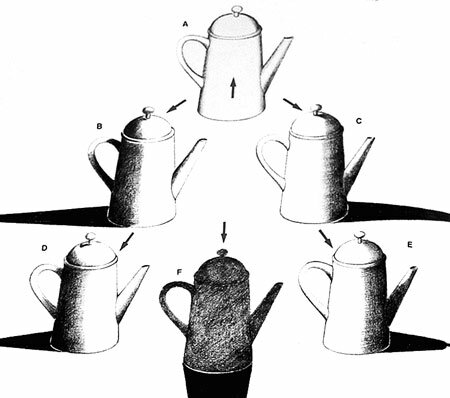 Directions of shadows on the objects that have a main light from a central point. 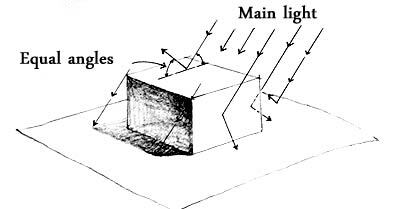 * Look how the object receives lights in the area with shadows. The strength of the light or the position will influence the shape of the shadow. 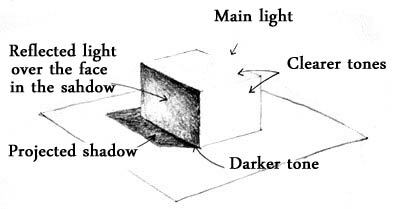 The shape of the object that stands between the light source and the soil determines the shape of the shadow. The tonal variety also depends of the shape and the reflections it receives. 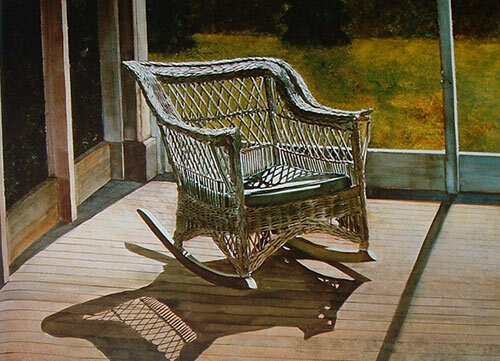 In this work of George Shook we can see the complex pattern between light areas and shadows in the chair itself and on the floor. The spotlight is well defined, and the representation of reality well understood. Is this a good example of a drawing with shadows. The shadows are blue because of its relationship with the snow and ice. 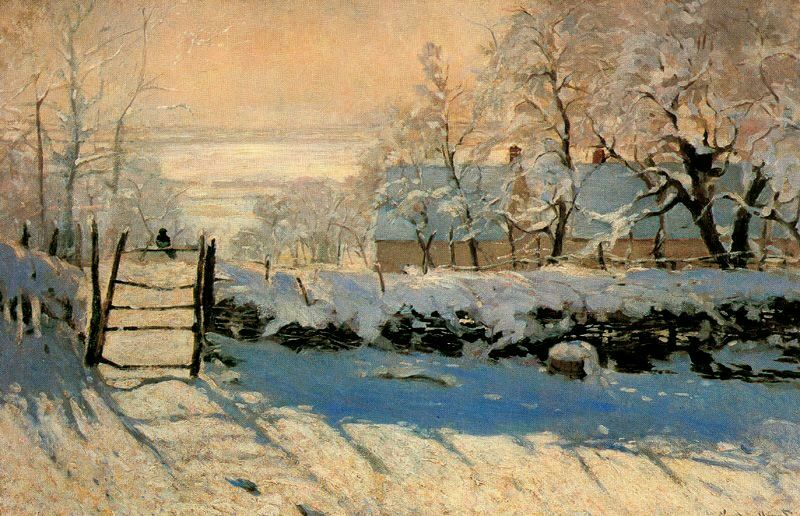 Monet painted the shadows with complementary colors. Violet and blue as opposed colors to yellow and red. In this painting, the shadows of the trees are reflected in the water. This generates the corresponding red color of the trees inside the water. Also, the water surface gets the reflected lights that comes from the trees. A backlighting where the green grass receives a shadow with blue color added. Women’s clothes are blue, with violet and yellow reflexes. The contrast of light and shadow is more spectacular and varied by using more colors in the shadows.